This is, perhaps my favorite time of the year. Spring brings a fresh start to almost everything. You can almost witness the changes in real time here in Portland – everywhere you look, something is bursting fresh. OH, the colorful blooming bushes, things poking up through the ground and that so very green Pacific Northwest landscape – it’s a beautiful momentum that just can’t be ignored. 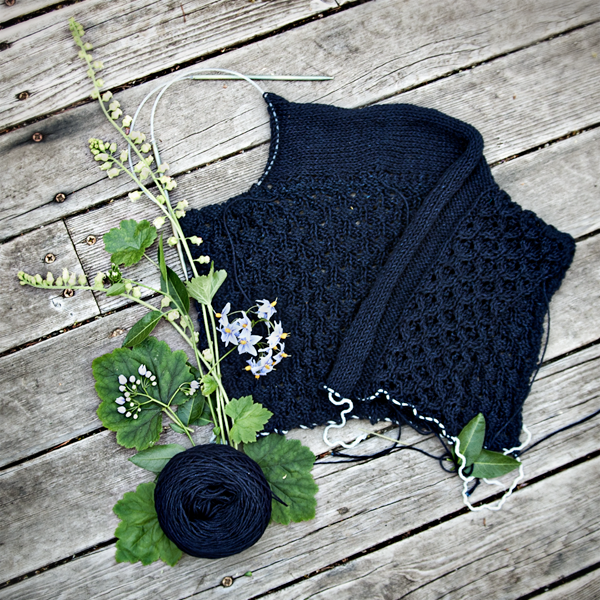 Fueled up by this incredible energy, it was easy to dive into that Den-M-Nit yarn and cast-on my Cerisara cardi. I’ve had lots of fun getting to this point! I love learning new things, especially when it comes to knitting. And gardening and yes, even photography. This project has everything! 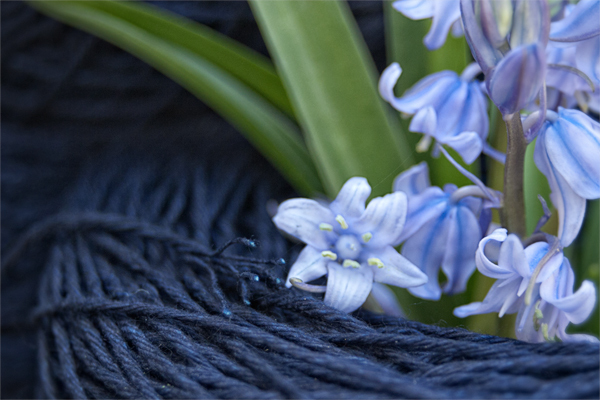 Because I’ve been surrounded by blooms everywhere lately, I’ve been adding them to my knitting pictures a lot and if you follow me on Instagram, you know that I’ve been enjoying it so much. Here you see something I planted last fall – a blue potato vine (Solanum crispum ‘Glasnevin’) and some chartreuse naturalized coral bells that are popping up along the side of my house. 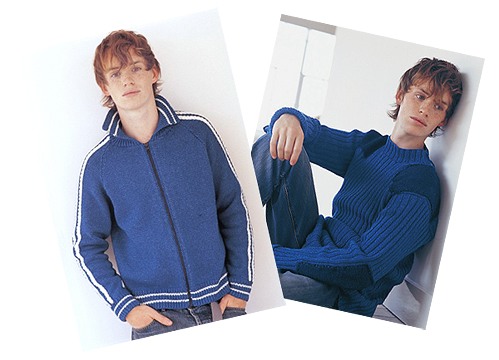 Chic Knits Cerisara has a built-in neckband with a modular construction that adds areas as you go. 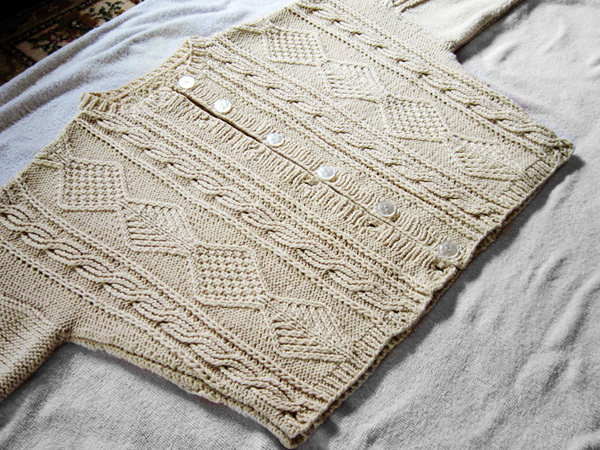 So far, I’ve completed the upper Back section of the sweater and the Left Front. Right now I’m working on the Right Front – am now a few inches in and it’s just a few more pattern repeats to where it all really comes together. All three segments are worked to the same point then joined for the lower Body. But is it coming out like I expected? 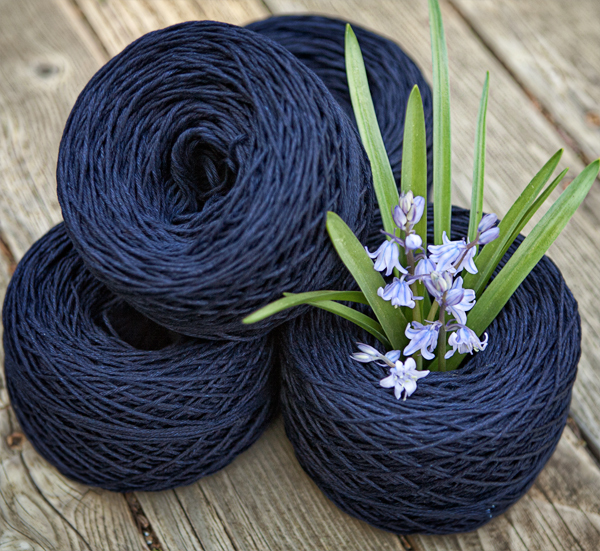 Now, I am a total newbie when it comes to working with indigo yarn. But at the end of the day It’s Just Cotton. I knew the big diff was maybe the color coming off on my hands (stay tuned for part 3 of the saga where we take a look) but I also knew after a few rows that this yarn felt much like other cellulose fibers I’d worked with in the past. And here was where I hit my first glitch, where even though I’ve had an experience before, I forgot to learn its lesson. On my first try (yes, what you see above is Try #2), I cast on using nickel needles. I was concerned with the color migration and thought I’d be able to bypass it with that type of surface. But what happened was even though my Stockinette swatch was great, the tension of the lace patterning once several inches of the cardigan were done was just a bit loose for me. Since I never have been shy about re-do’s, it was time to move on to Try #2, this time working with bamboo needles, who have happily brought the fabric back in line. Bamboo (or a wooden needle) offers a bit of surface resistance to a cellulose fiber like cotton (which can be slippery) and that makes for a more controlled gauge and enjoyable knit. Part of picking this sweater pattern was to have something that would show off the natural wear patterns that would happen with a surface-dyed yarn like this. This is a close-up of the upper Left Front. 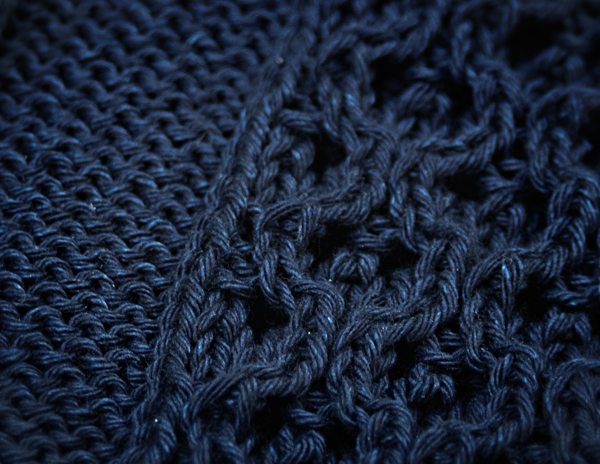 You can see the lace pattern developing and how it merges in the neckband area. Lovely – but how will it fade? Can you see the variations in color already happening? These will continue to fade and overall, the entire fabric will lighten through washing and wearing. The lace patterning HAS those Highs & Lows it needs and at a smaller scale, so does that field of purl stitches. Coming Up in part 3: Colorful and challenging – working with and photographing that incredible Indigo BLUE. Back in my early days, ooh, two decades out of the five ago I started knitting, I was entirely enthralled by a certain kind of yarn but much too SHY to actually make anything out of it. Now, coming from someone who knit a whole sweater out of dishcloth cotton, that is, perhaps, a bold statement. 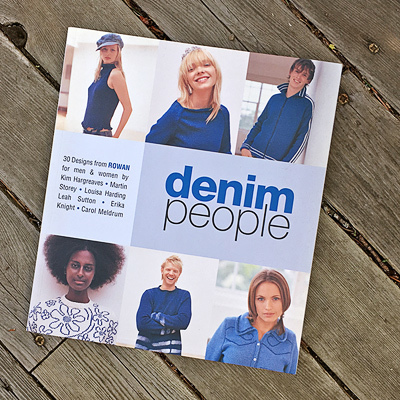 But even with all that inspiring, lustable goodness, and the fact that I WAS one of the Denim People (aren’t we all!) I only got as far as getting the yarn itself. And I got a ton: 3 cones worth, dark navy, 2000 yds per cone – which is [pulls out trusty converter], hmm, 3.4 MILES of YARN, yes, you read that right. Well, this week is The Week I now am going to go down That Road. I found out, while sorting and saving the favorite yarns in my stash, I could not resist its dark navy siren call any longer and started winding off some skeins. The yarn I purchased was called Den-M-Nit and although it wasn’t the branded the same as in the magazine, it was from the same original mill source. Also common to both? An indigo dye process, just like the one used in the making of blue jeans, where the fiber itself is surface-dyed. If you open up one its six plies, you can see their inner white cores. The dye does not fully penetrate the strands – it is called ring dyeing – and it’s usually achieved through the rope dyeing process (cool industry-on-parade link here). 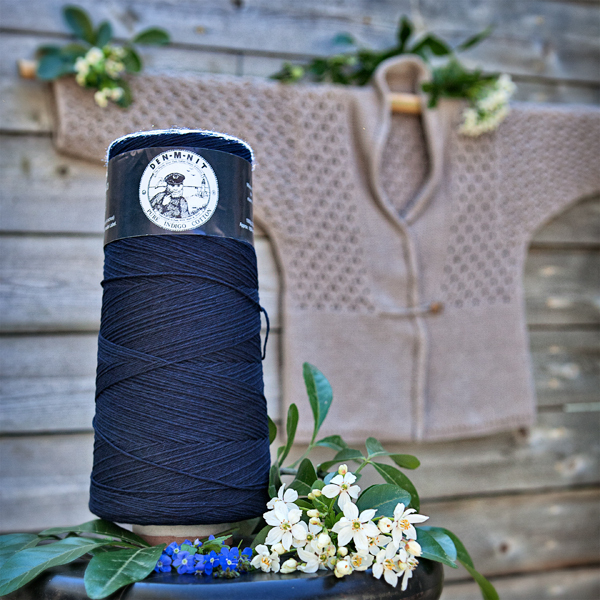 This allows the outer layer to fade away from blue-to-white in degrees through wear and washing, leaving a lovely tonal range of blue over the surface of the fabric, whether woven or knit. The best kind of design for this variable fading fabric is something that has Highs & Lows. Like cable patterns or knit/purl combinations, or in my case: Lace formed with yarnovers and decreases, like in my design CERISARA. The decrease stitches are higher than their neighbors and, in the case of the CERISARA design, push the next rows stitches higher for awhile as well. It’s almost like a series of small cables waving back and forth – beautiful. 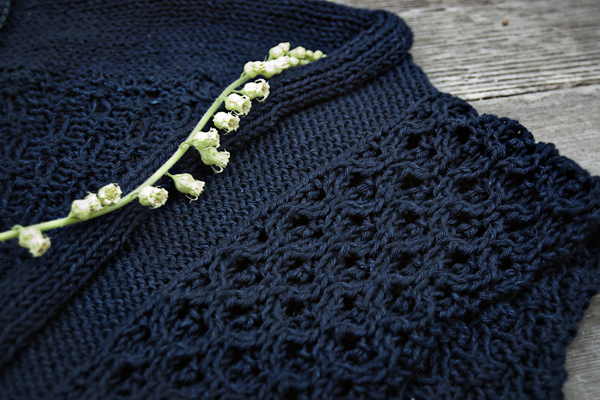 That eyelet patterning is coupled with reverse Stockinette stitch, which has a high/low characteristic as well in its purl stitches and should subtly highlight the indigo fade. The secret of success to using this yarn, which not only fades but SHRINKS in length (just like your favorite jeans) is to knit the garment you’re making LONGER. No compensation is needed for circumference/width. Because this is a modular, organic design, which is defined by length proportions to begin with, this should be quite doable.